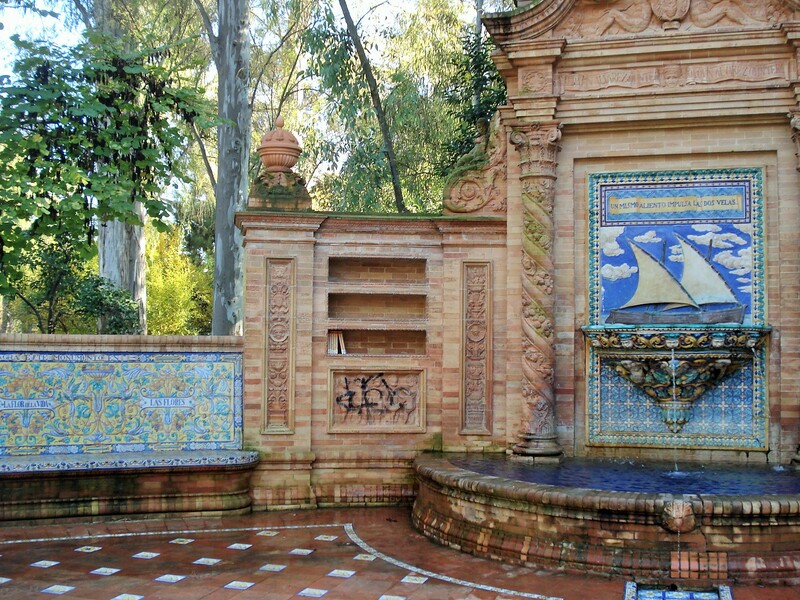 Maria Luisa, Infanta of Spain (1832-1897) was the younger sister of Isabella II, queen of Spain. 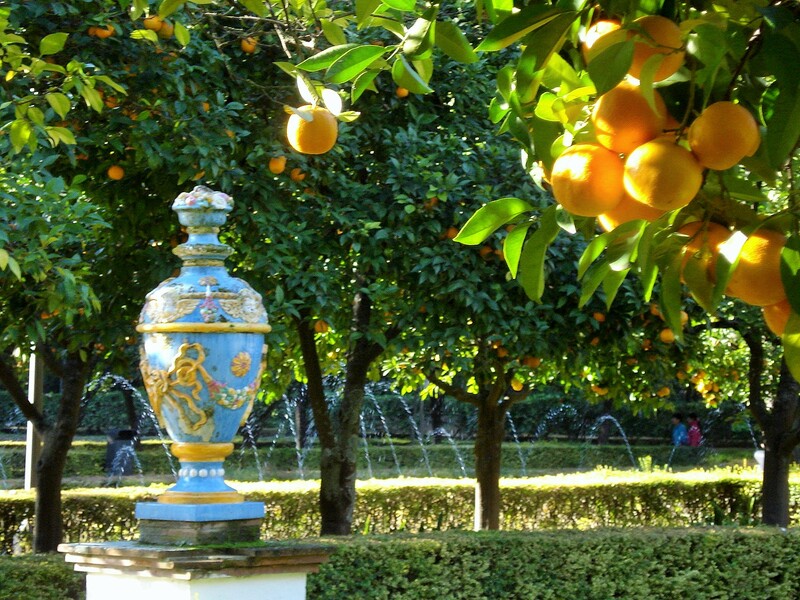 She married Antoine, Duke of Montpensier, youngest son of the French King Louis Philippe, and became Duchess of Montpensier. 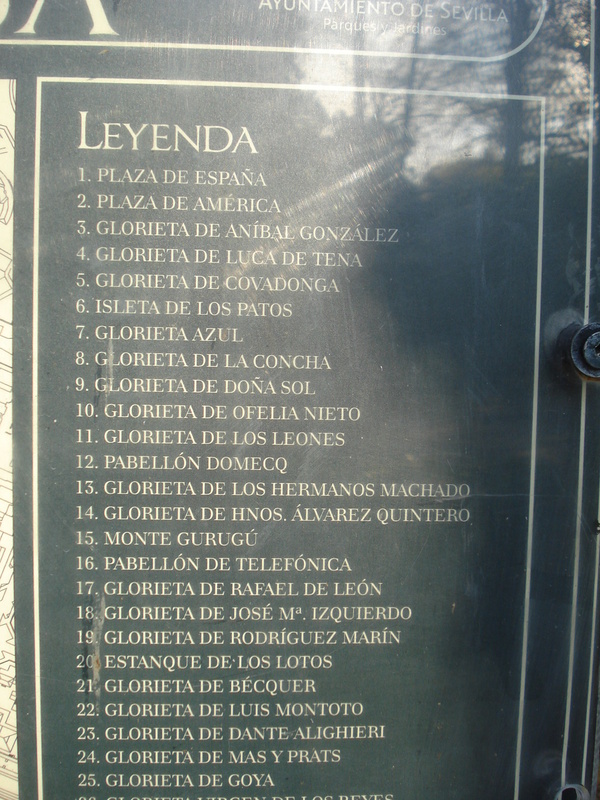 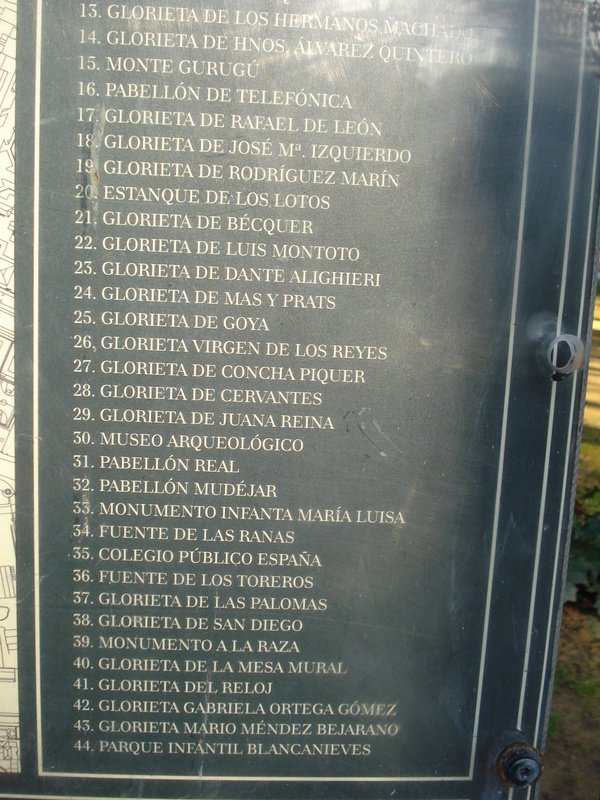 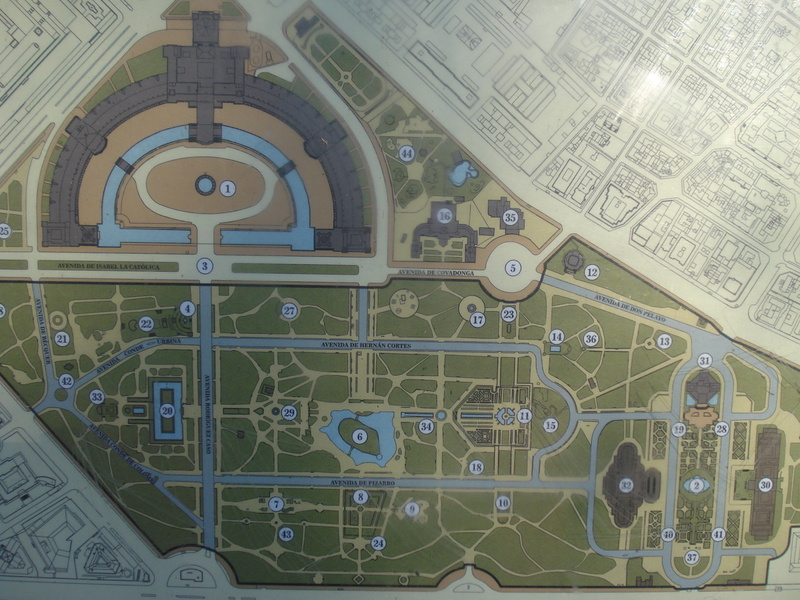 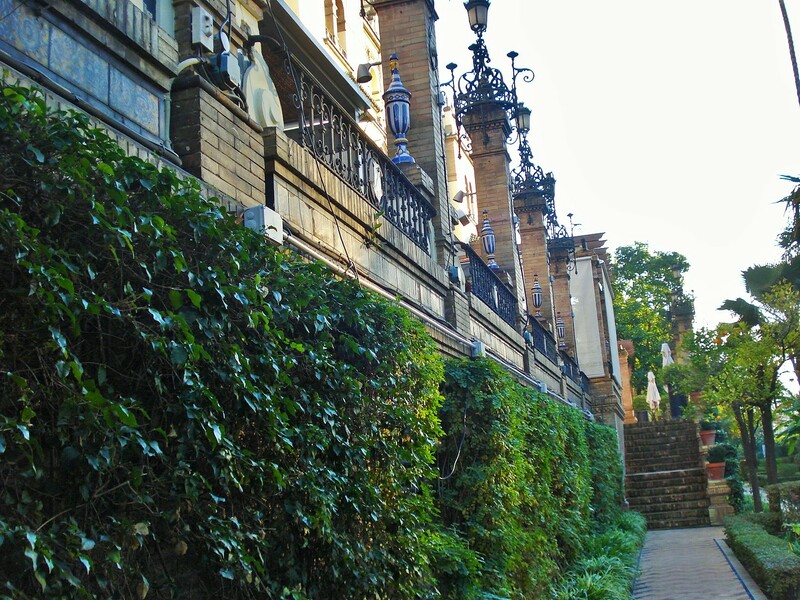 Most of the grounds that form Maria Luisa Park today where originally part of the Palace of San Telmo and donated by Maria Luisa to the city in 1893 to be used as public gardens. 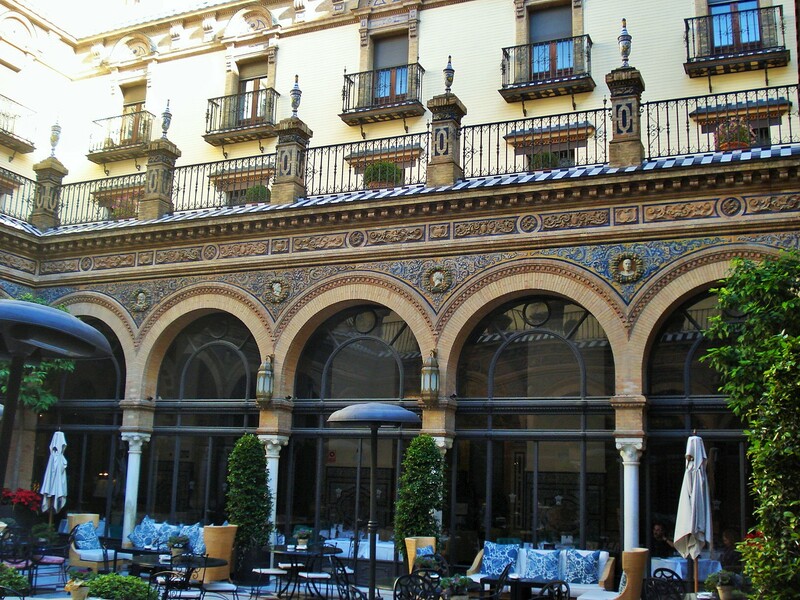 The palace , a magnificent example of Spanish baroque architecture was rehabilitated and converted in the 1990s into the seat of the autonomous government of Andalusia. 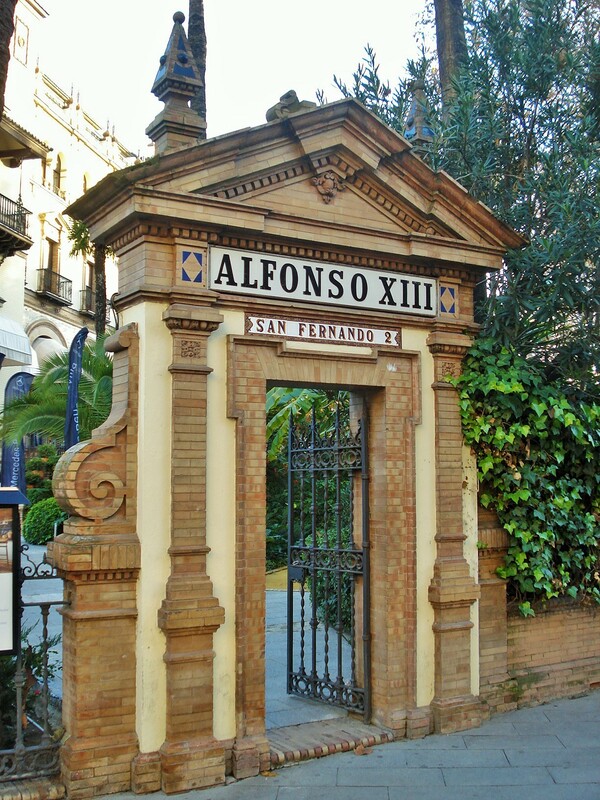 It stands today just outside Maria Luisa Park. 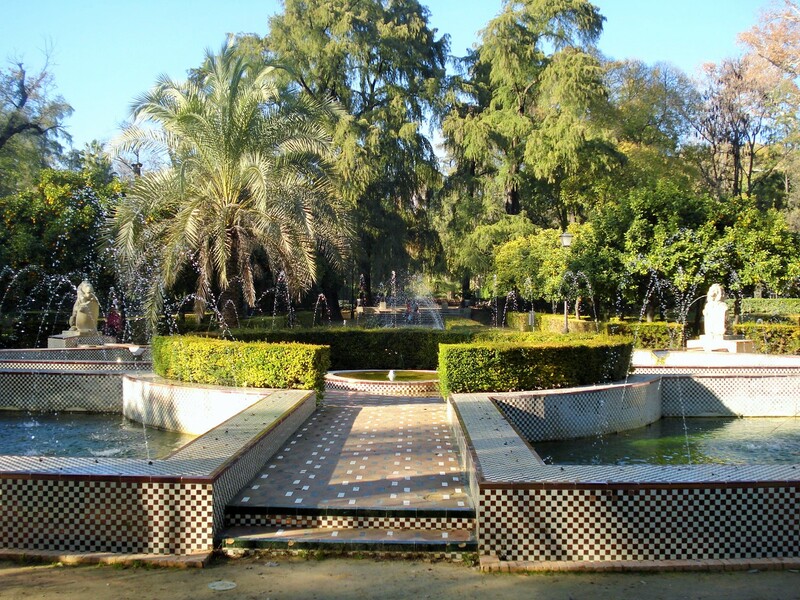 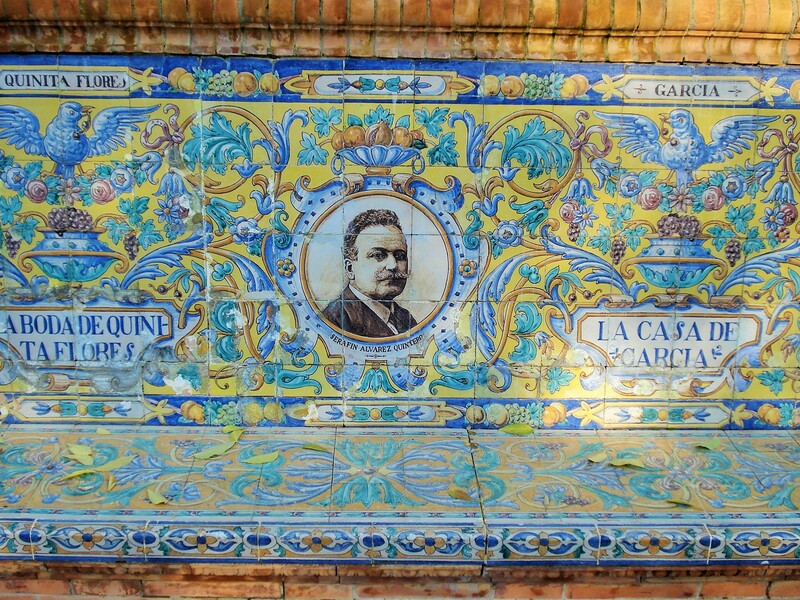 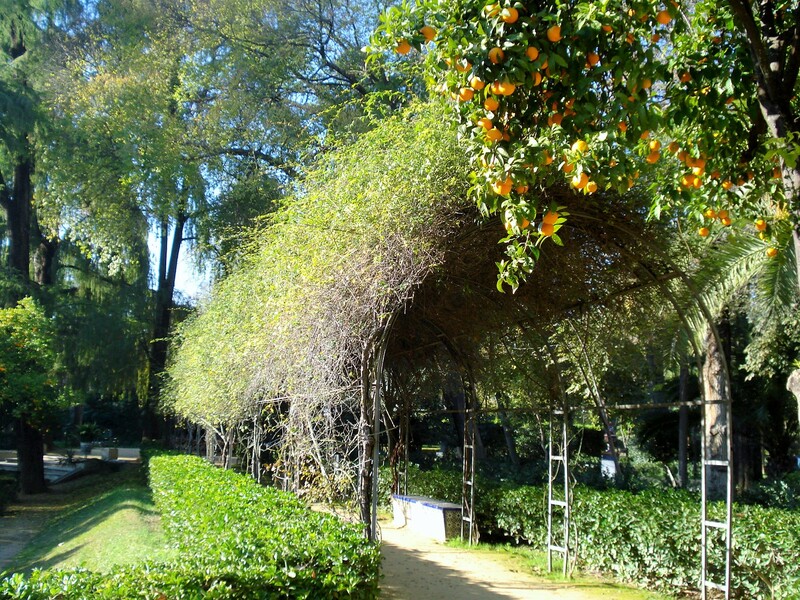 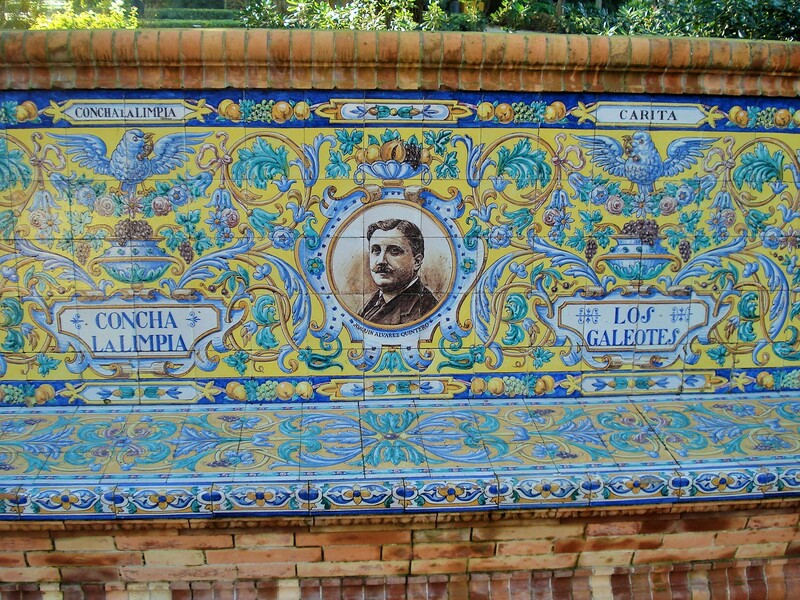 French urban planner and landscape designer Jean Claude Nicolas Forestier, who also created the Bagatelle Rose Garden and the Laribal Gardens in Barcelona, started work on the park in 1911. 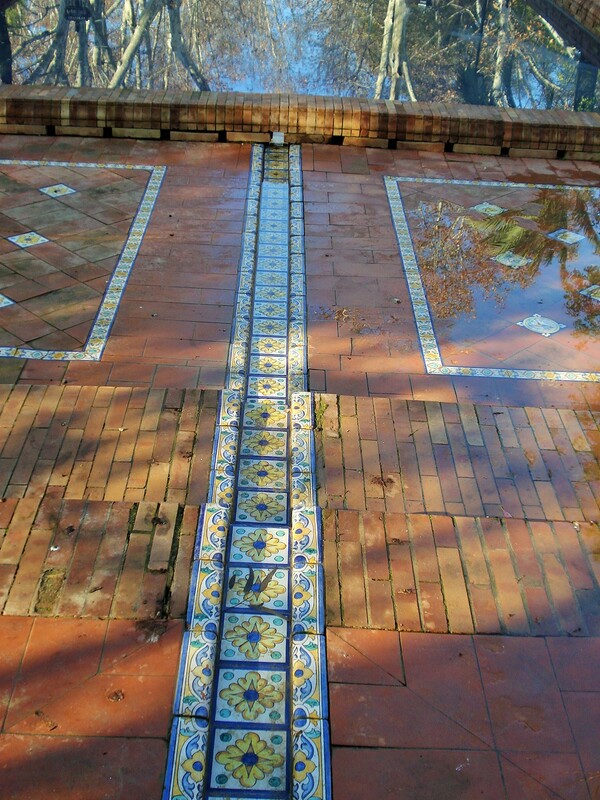 Also in preparation of the 1929 World’s Fair, architect Anibal Gonzales began work on the Plaza de Espana building and some of the pavilions. 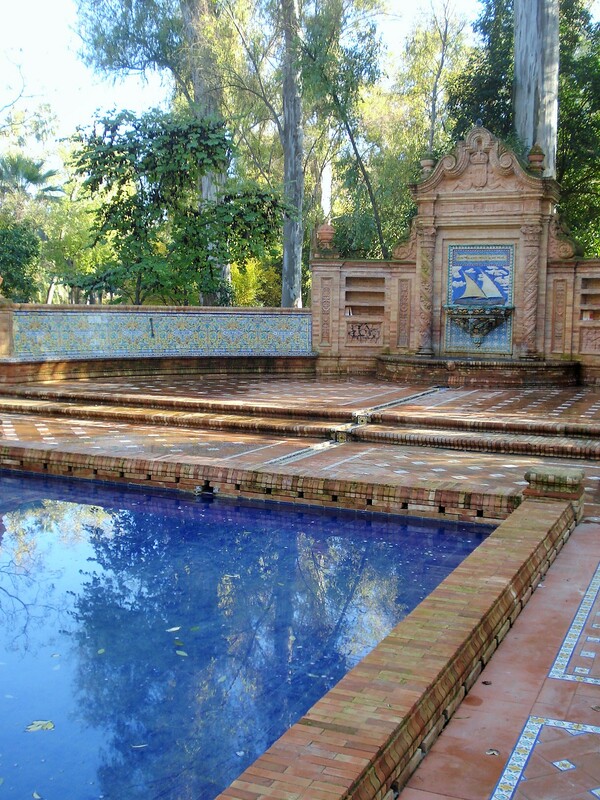 Under Forestier, who had been heavily influenced by the gardens of Andalusia and Morocco, the Park became a Moorish inspired extravaganza of tiled fountains, ponds, arbors, pavillions and other structures, planted in a lush Mediterranean style with vines, bougainvilleas, roses, palms orange trees and flower beds. 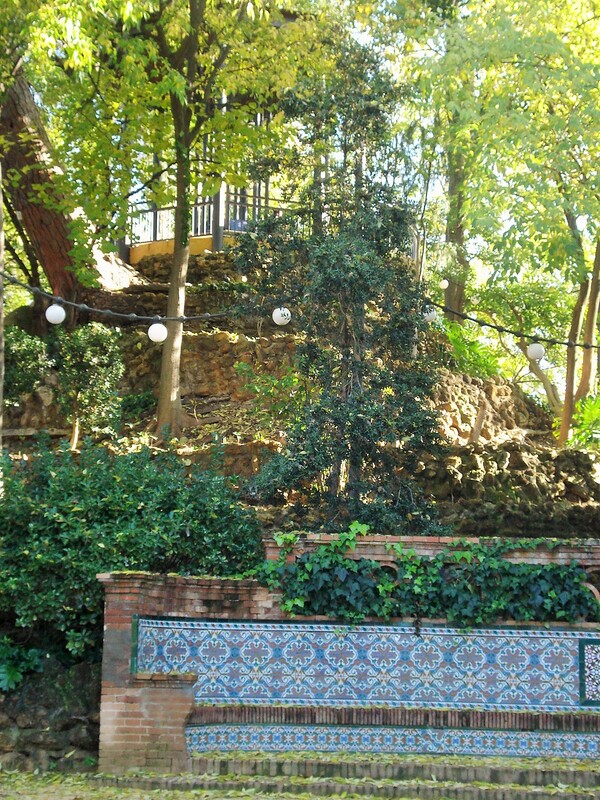 I discovered Forestier’s work when in Barcelona, visiting the stunning terraced Laribal Gardens on the hill of Montjuic. 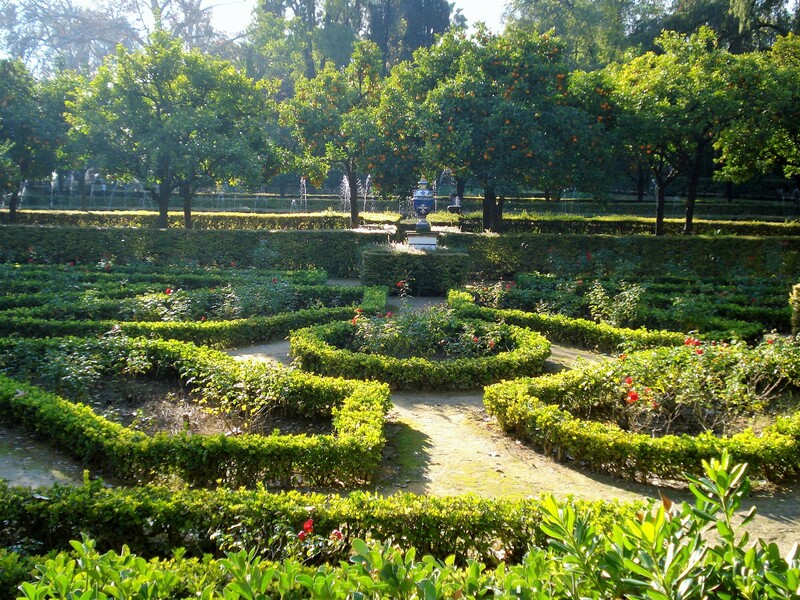 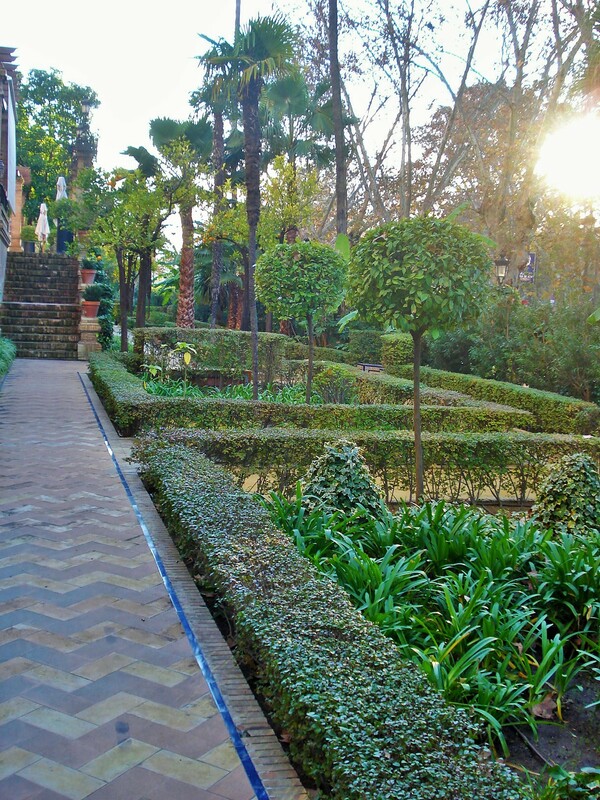 These gardens lead from fountains to gazebos to arbors to rose gardens to the top of the hill where you discover the sweeping views down the hill with water stairs inspired by the Alhambra leading back down. 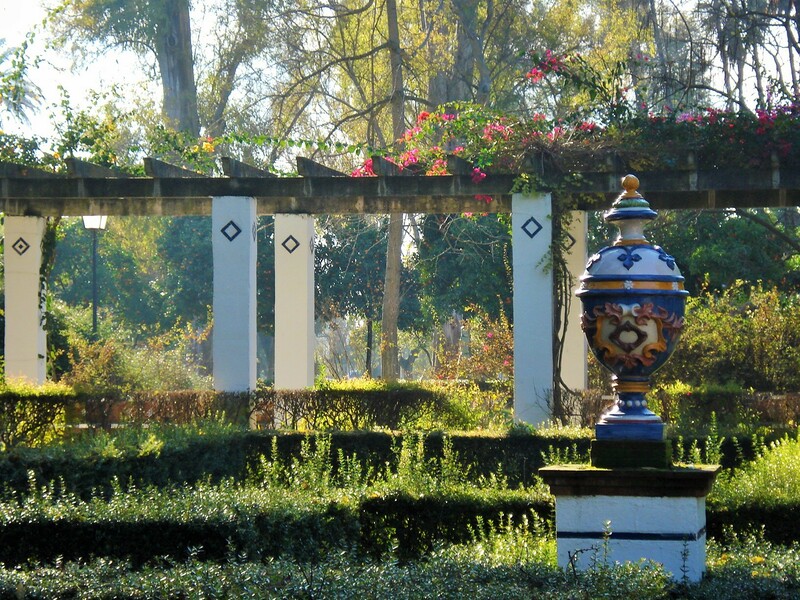 This element of surprise and wonder is one I have found in all of Forestier’s gardens, whether in Paris at Bagatelle, Morocco at the Jardins d’Essais or here. 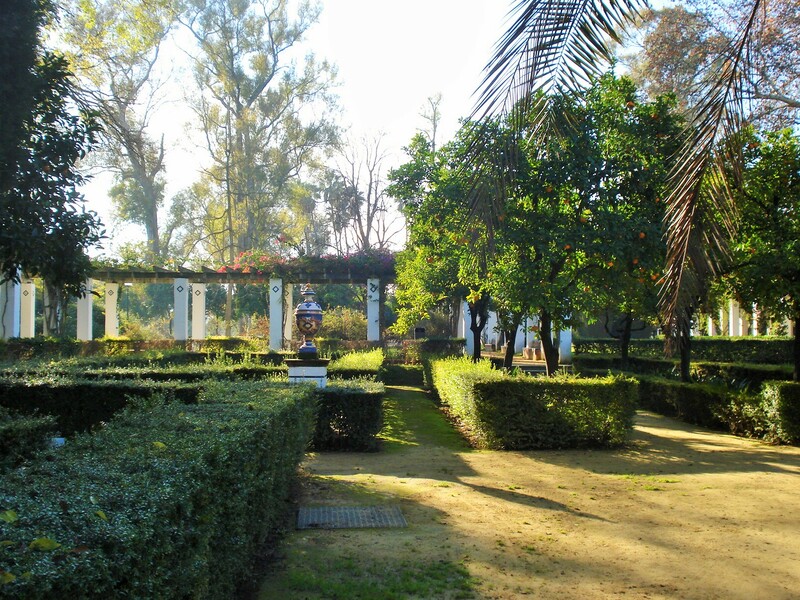 This park being such an expansive and complex creation, I am featuring it through several posts.This first one showcases the Garden of the Lions (11) and the Fountain of the Alvarez Quintero Brothers (14) just behind it. 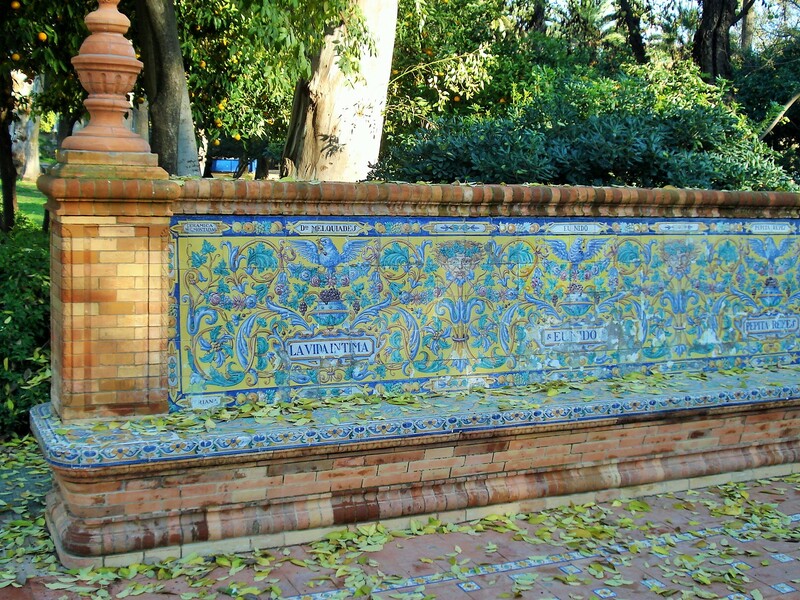 Both are stunning in very different ways. 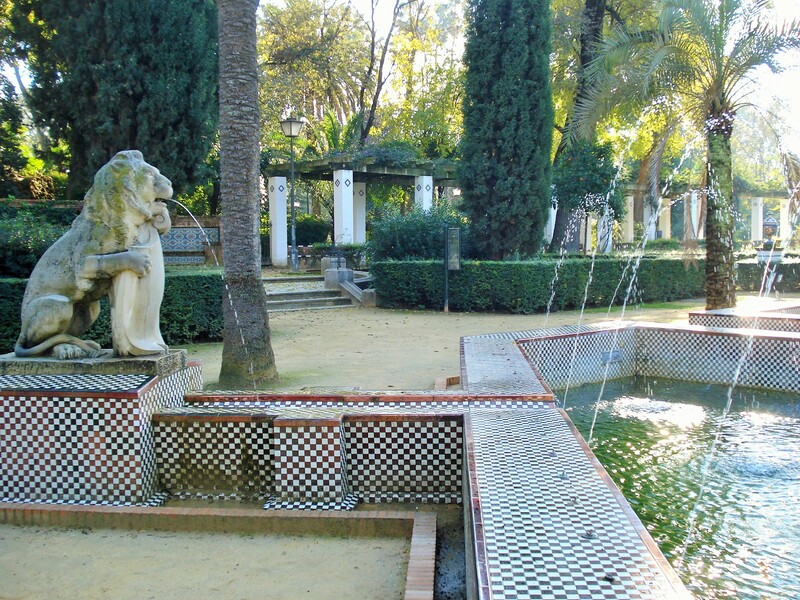 The Fountain of the Lions features large fountains surrounded with sculptures and geometrical borders with a clear Moorish influence. 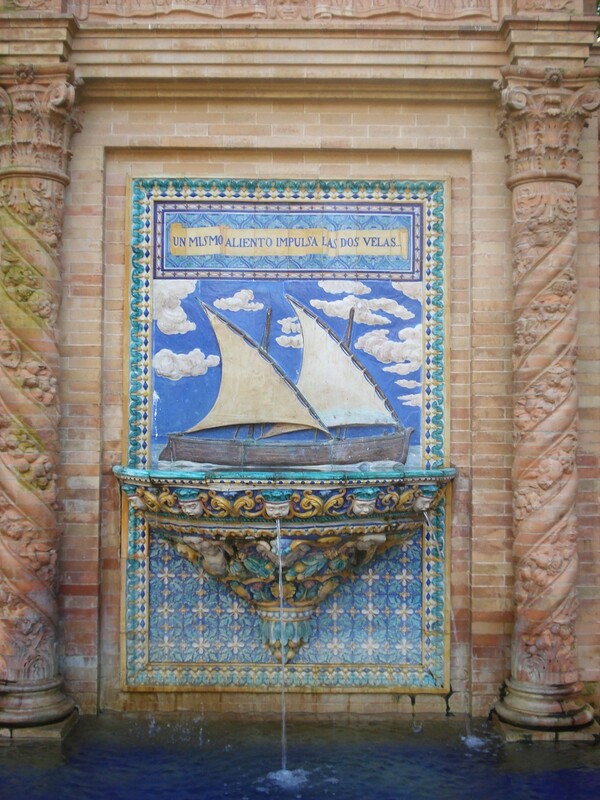 The Quintero fountain is a masterpiece of tile work that ties in with the incredibly detailed allover moasaics of the Plaza de Espana at the other end of the park. 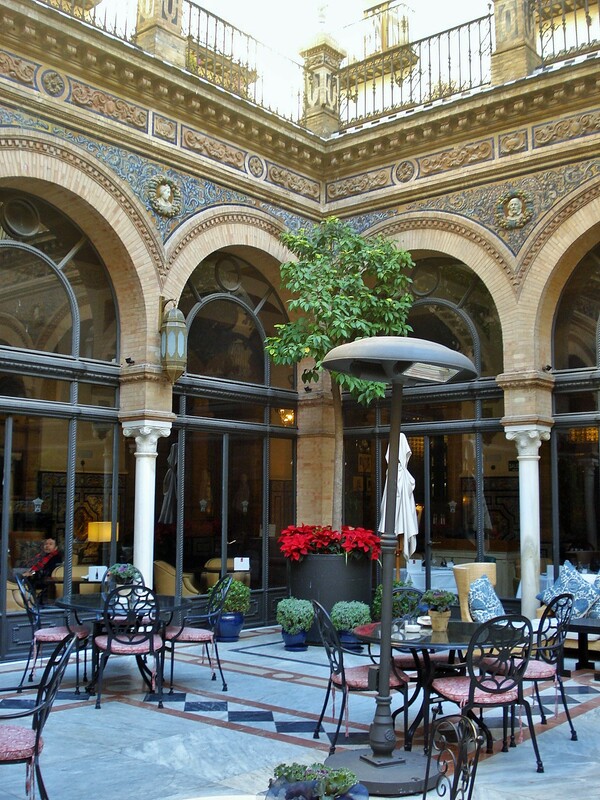 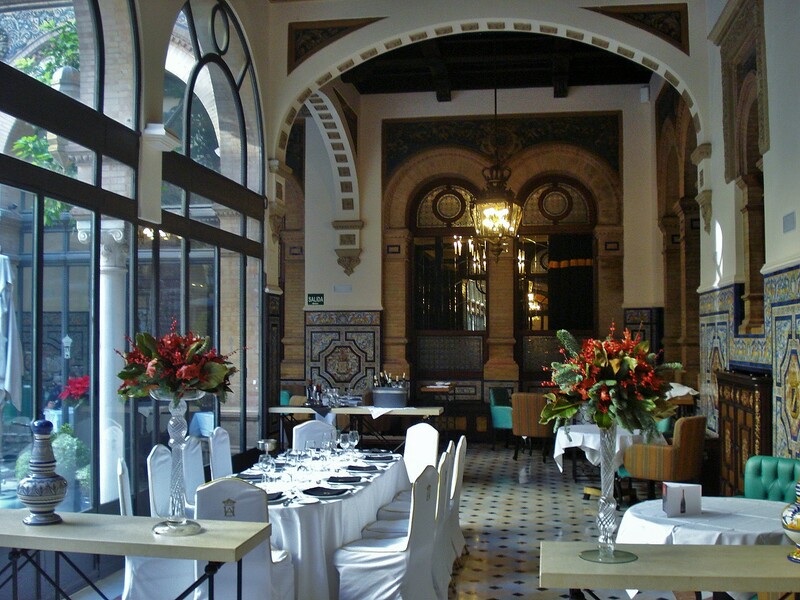 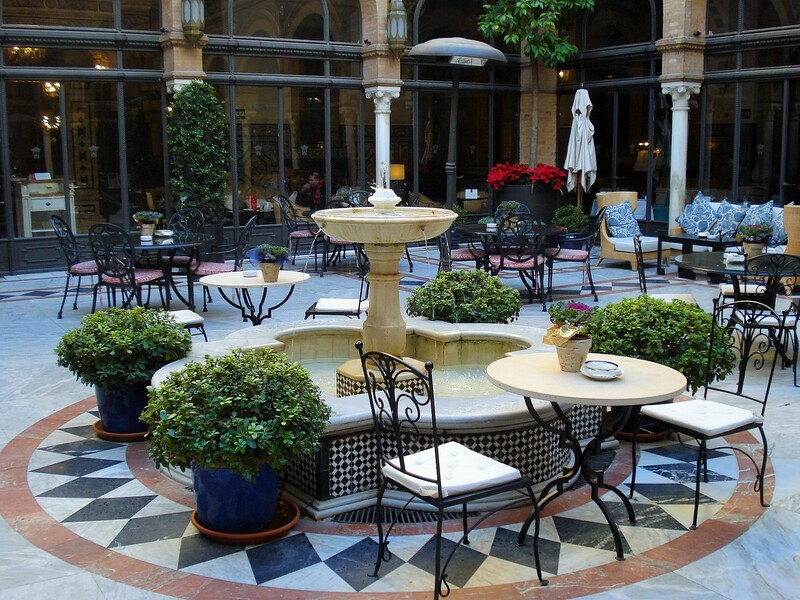 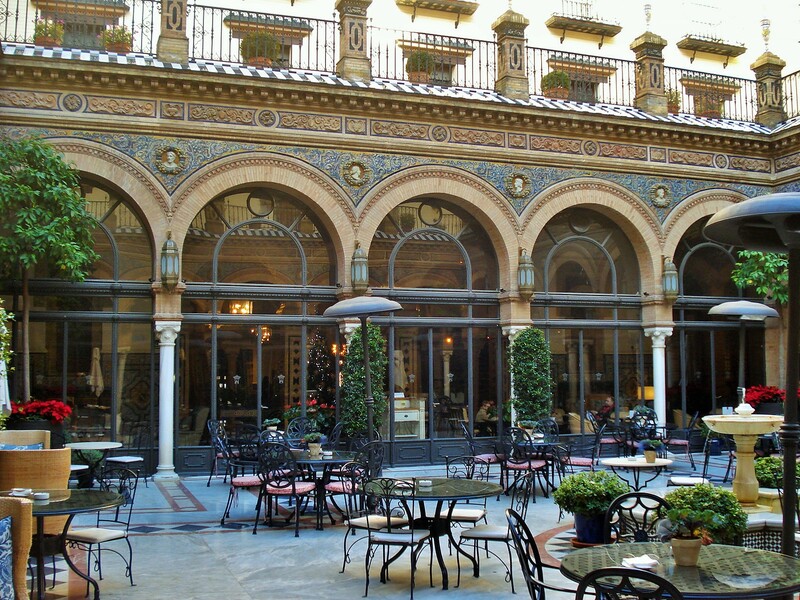 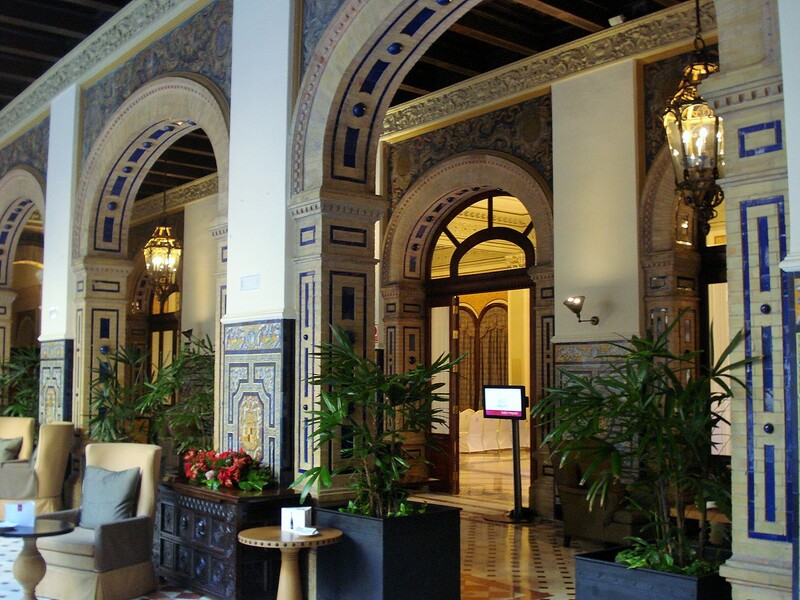 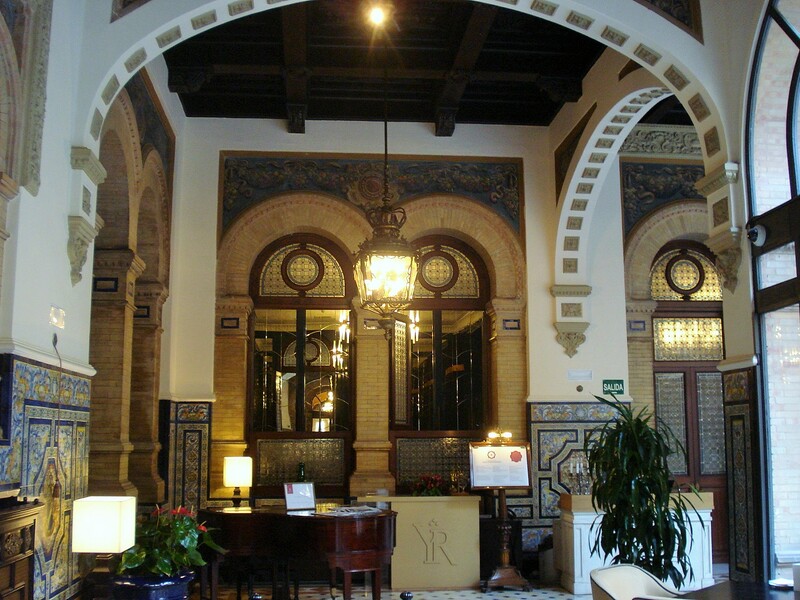 Hotel Alfonso XIII, or the Alfonso as it is often referred to, is a historic landmark building in old Seville, near the Cathedral and the Alcazar. 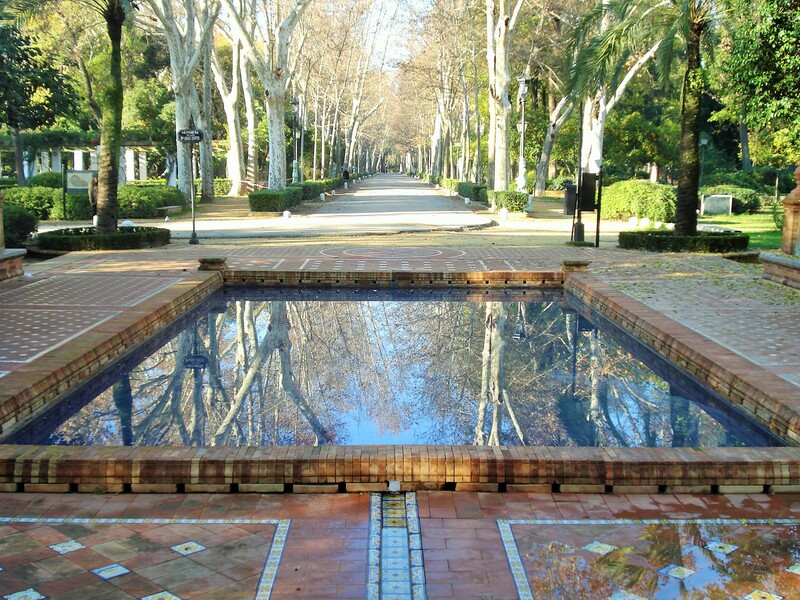 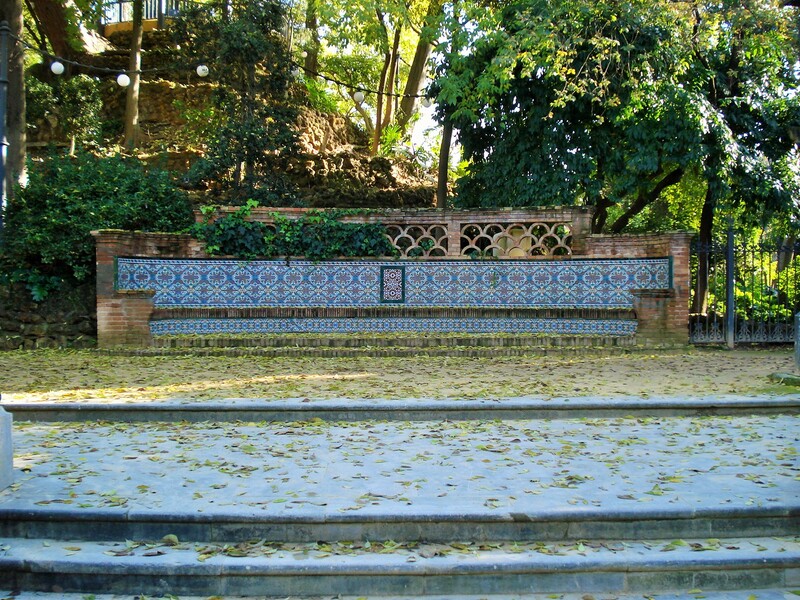 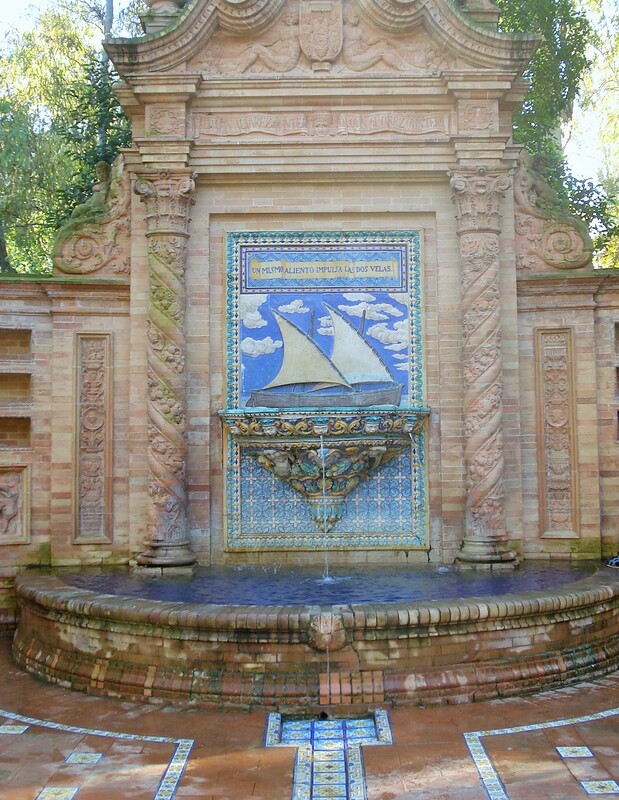 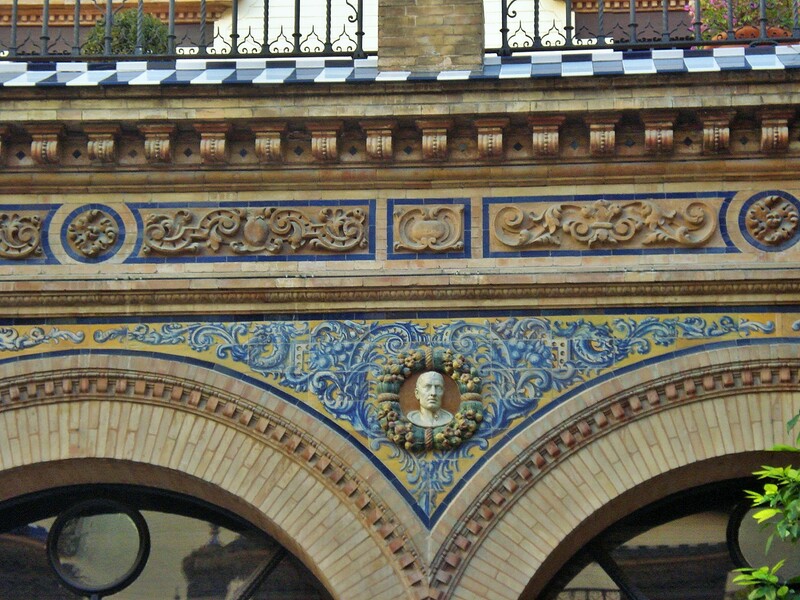 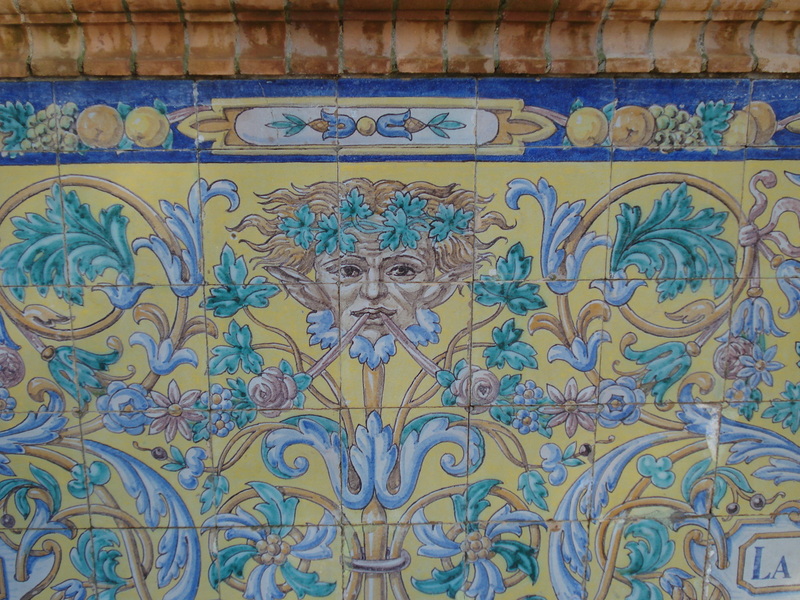 Inaugurated in 1929, the year of the World Fair that was instrumental in bringing to Seville the Plaza de Espana and Maria Luisa Park, it is a materpiece of neo-mudejar, or neo-moorish style, architecture, with arches, tile murals and water features. 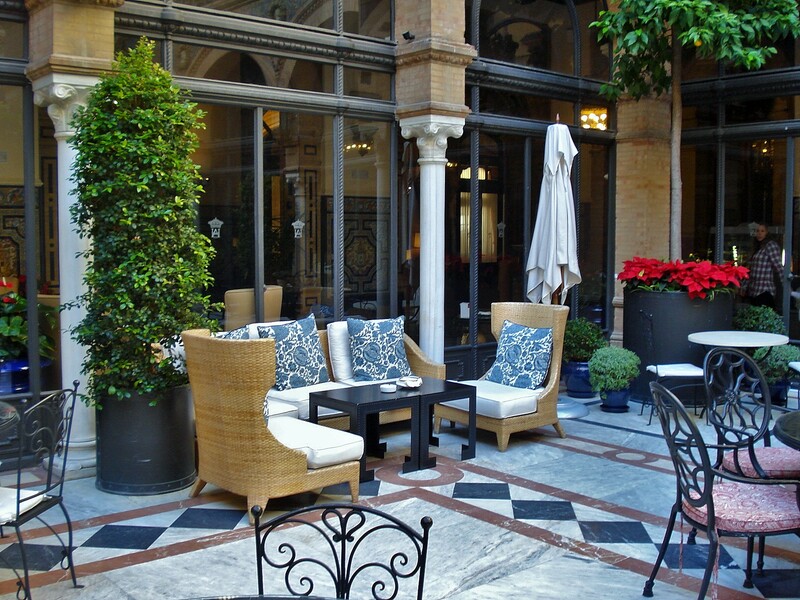 The patio is truly the heart of the hotel, with reception rooms, lounges, and the restaurant all laid out around it, and it is indeed a treat to spend a leisurely hour there having drinks or coffee there. 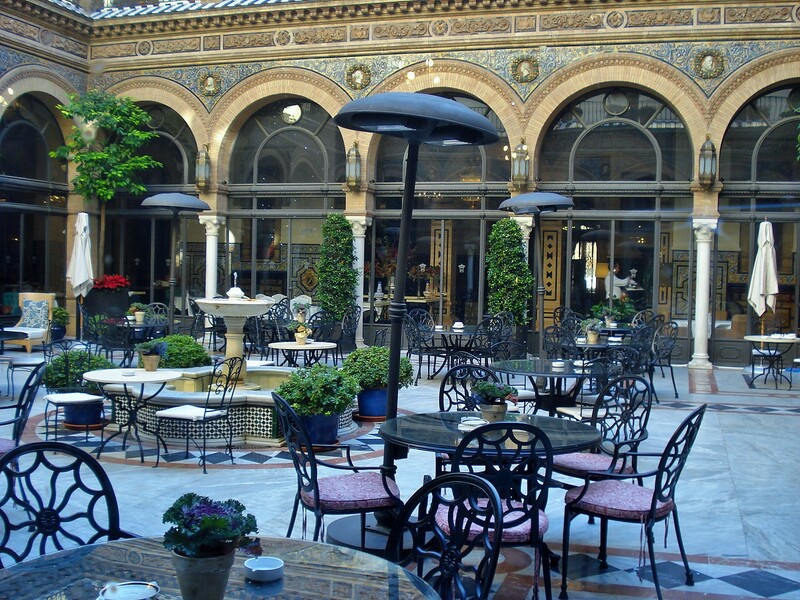 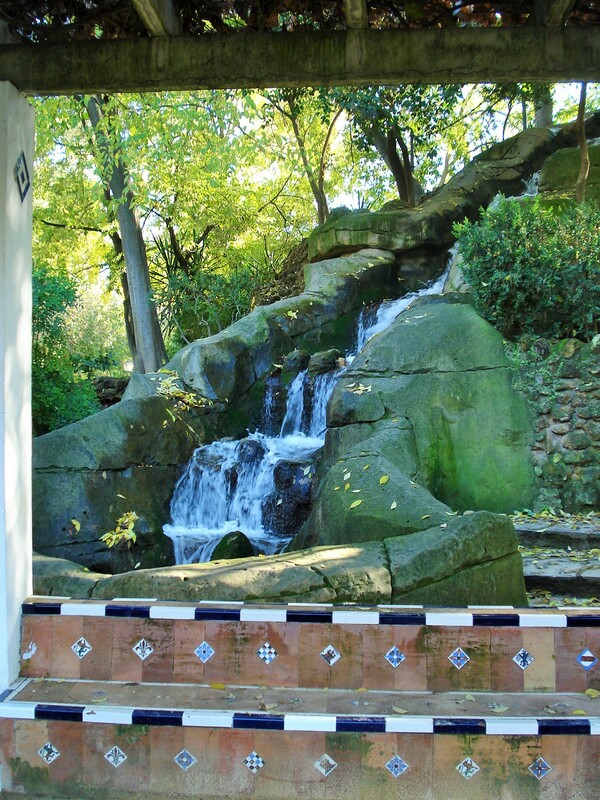 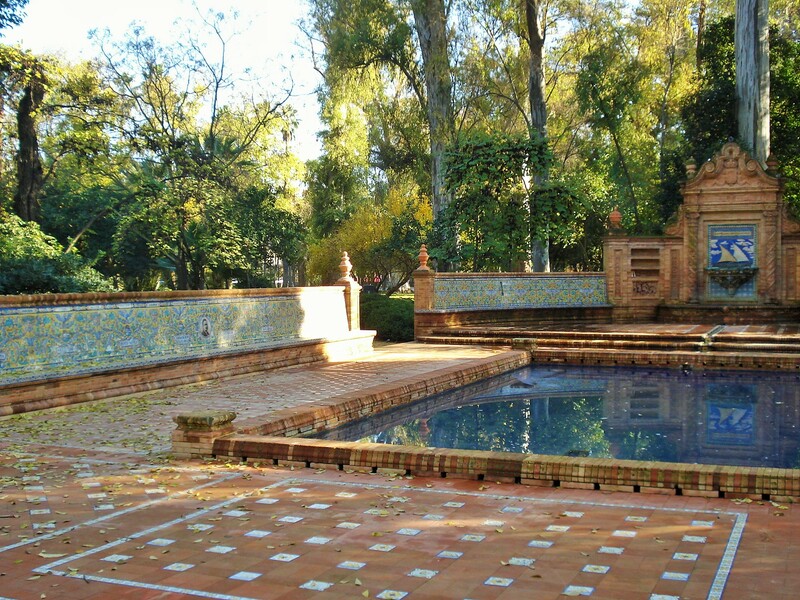 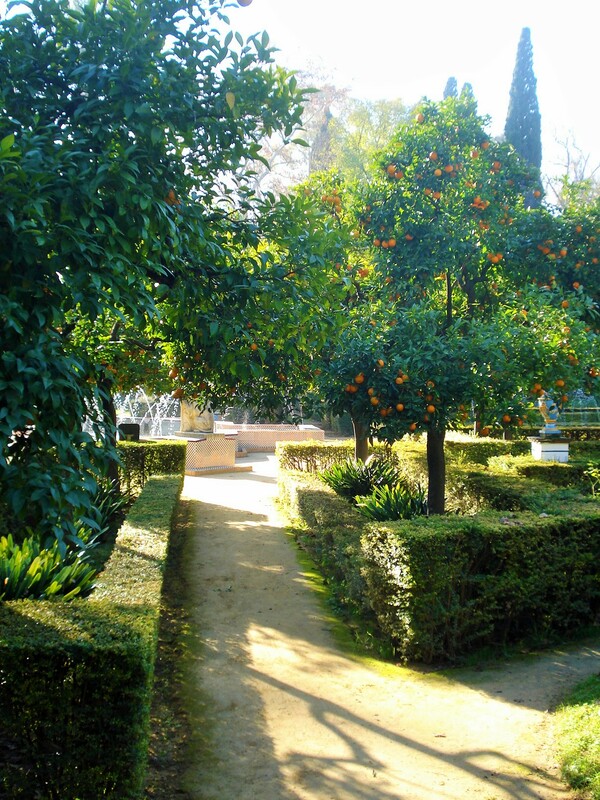 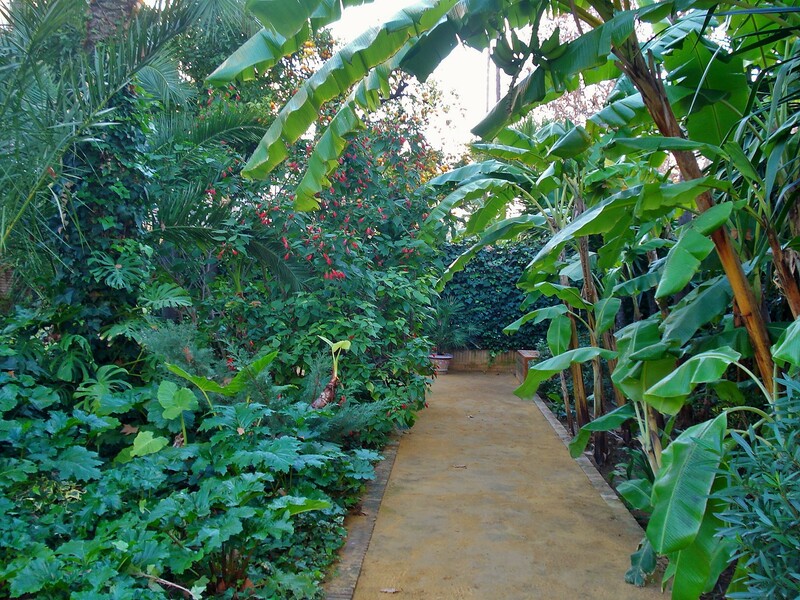 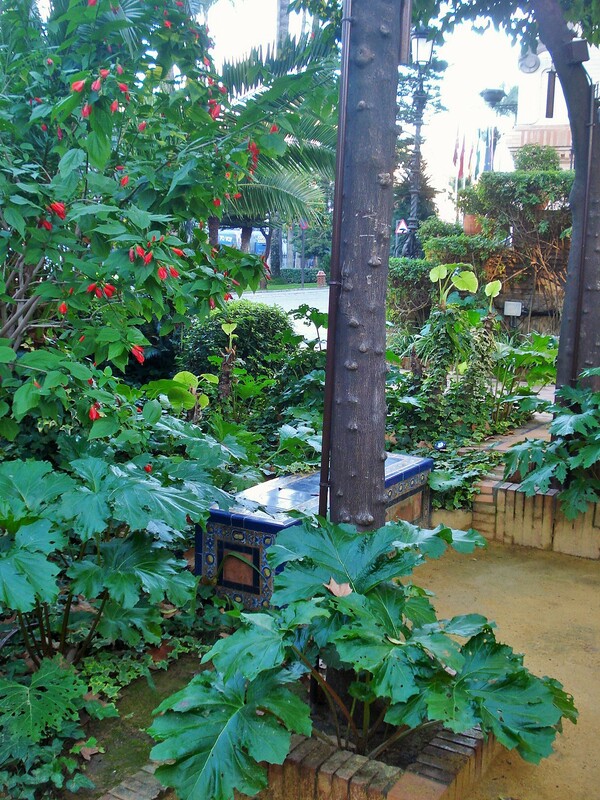 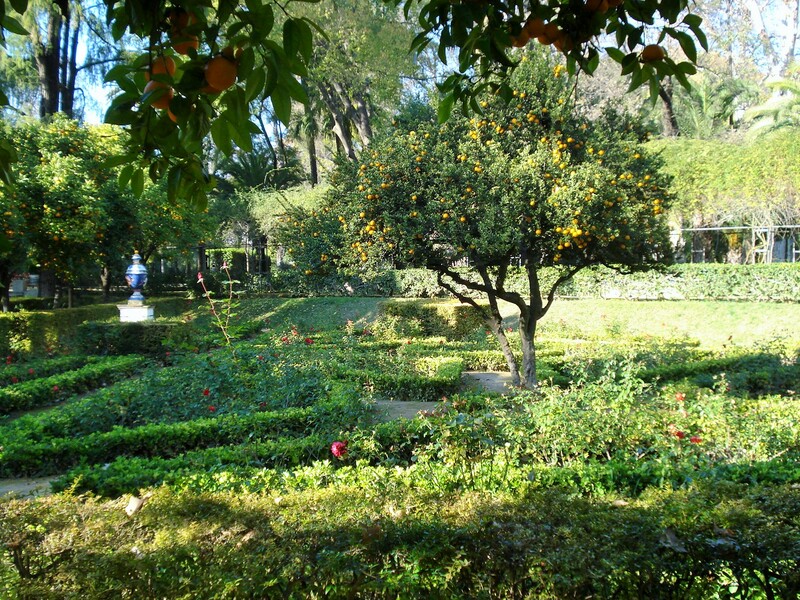 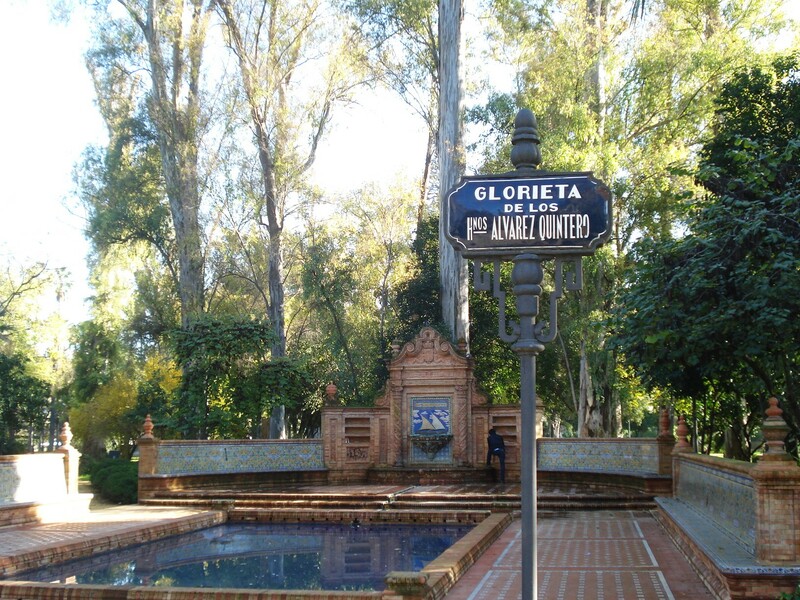 The grounds outside are also landcaped in a distinctly Andalusian style. 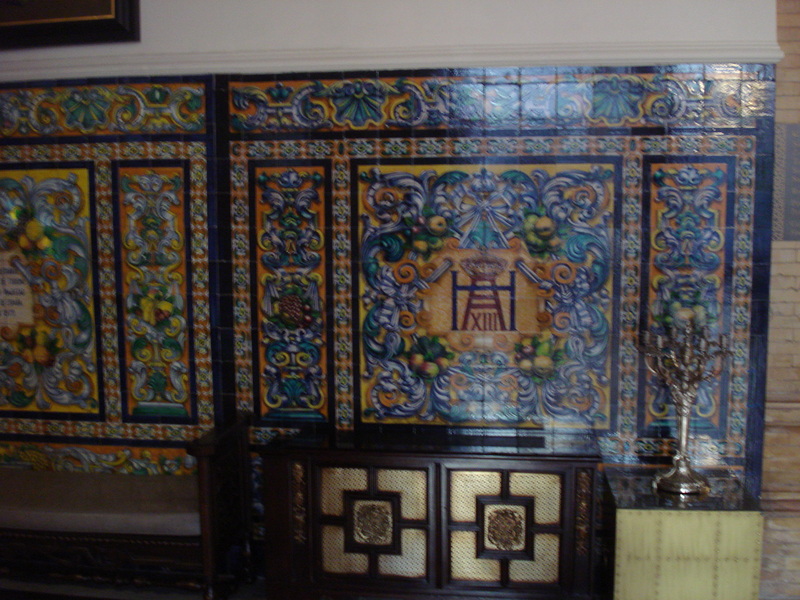 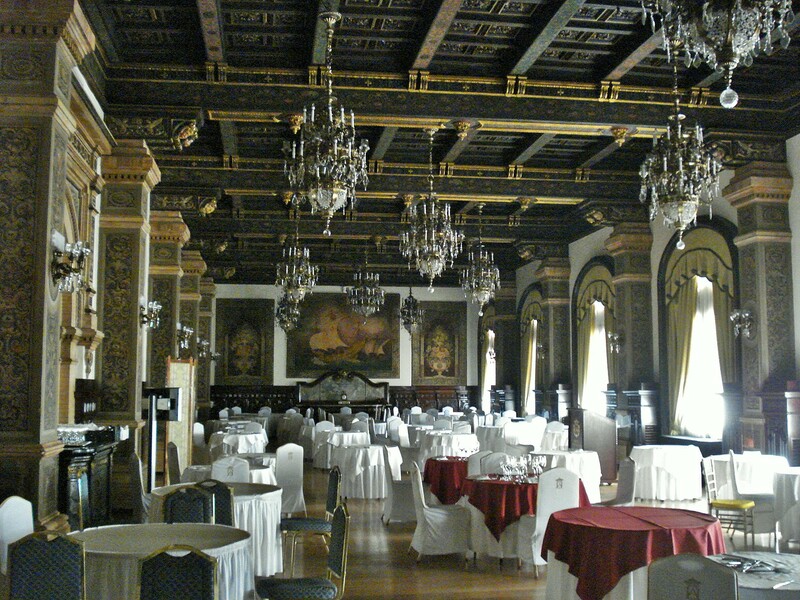 And of course, the stunning reception rooms around the courtyard.